Papaya is a healthy fruit with ample nutrition. However it is considered unhealthy during pregnancy. Most of them are myths. Talk to your nutrition expert to create your healthy diet plan during pregnancy. If you are pregnant or already a mother, you may have heard, that eating papaya during pregnancy is considered bad. But do you know it's just another misleading and exaggerated old wives tales? Well, let know more about the myths associated with eating papaya during pregnancy. This is merely a myth because ripe papaya does not cause any problems. However, Consuming unripe or semi ripe papaya during pregnancy may lead to uterine contractions. So, what actually happens is that an enzyme found in unripe papaya latex is known to activate prostaglandin and oxytocin hormones that are responsible for labour contractions. Pregnant women are advised not to eat papaya during pregnancy. Papayas are considered unsafe during pregnancy as they contain pepsin and papain that could slow down the development and growth of the fetus. However, this is just a myth because eating ripe papaya has no such effects. Papain present in papaya may deteriorate important membranes of the foetus posing risk to the its life. There is no scientific evidence to prove this claim hence it is just a myth. As you may know papaya is considered good for digestion problems especially constipation. Eating papaya during pregnancy may cause excess bowel movement which could lead to miscarriage is also a myth. People believe that high content of fibre in papaya exerts pressure on the stomach and intestines resulting in miscarriage. However, there is no scientific proof about this claim. 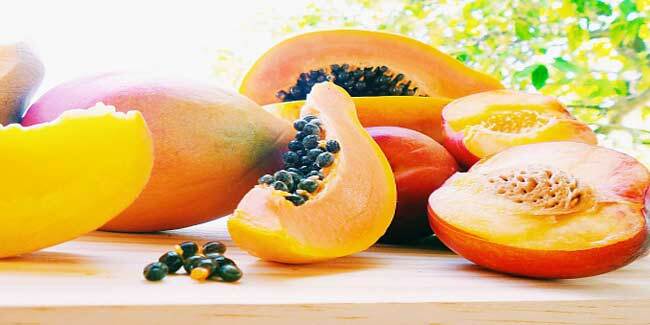 This is the most common myth that eating papaya during pregnancy may give you upset stomach. Latex found in unripe papaya is considered as a stomach irritant that puts pressure on the stomach increasing the risk of abortions. But eating a ripe papaya is completely safe to eat.